Melissa joined Connor, Rowan, and I on a walk down to Totem Park last night. Today I didn’t get out much, but did take a look around the neighborhood briefly. Weather: It was sunny and breezy today. Clouds were once again hanging over the mountains. Today it was overcast with a little bit of rain. Birds: I counted 6 Semipalmated Sandpipers down at the park, along with a few Spotted Sandpipers. There were several Ravens that seemed to be playing in the breeze over the park. They were flying in formation and making various manouvers as they flew circuits. 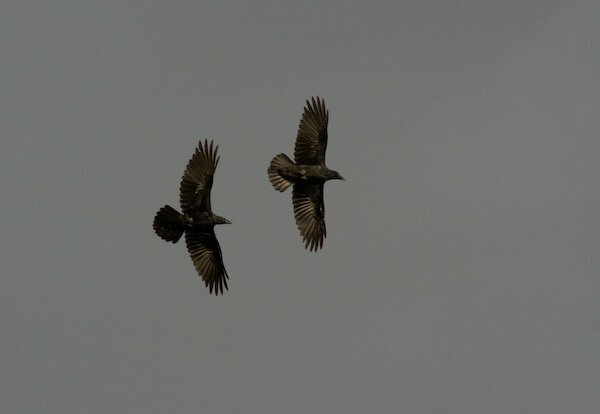 I could only see them for part of the time, as most of their flight pattern was obscured by the trees. Connor found a few feathers yesterday that were not fully developed when given up by the bird who lost them (I can’t remember, but I think they’re called blood feathers). We were not sure what kind of bird they were from. Perhaps a woodpecker. Today there was an Orange-crowned Warbler in the salmonberries right outside the home office window. I watched it pull a caterpillar out of its hiding place between two leaves. It was a pretty big caterpillar, and the bird had to make several attempts to finally get it dislodged. Invertebrates: Rowan has been a dedicated caterpillar detective lately. She spends a lot of time searching the salmonberries for caterpillars. Whenever she finds one, she brings it to me (whether I’m inside or out), to show me. We are trying to raise a few of them, so we’ll see how it goes. Connor told me about a place where there were lots of ants (its where he found the feathers mentioned above). I went and took a look, and sure enough, there were a lot of ants. They apparently have a colony at the base of a tree near our house. Yesterday’s warm sunny weather was apparently a good time for the flying ants to emerge, as there were quite a few of them crawling around, as well. With overcast skies and some rain, I didn’t see anything other than the small workers when I checked today. There were quite a few dead jellyfish washed up on shore yesterday at the park. I did not notice any on other recent trips, so it seemed odd that they would all appear today. I’m not sure what could have caused this.